In 2041, in the midst of a global resources shortage known as The Chaos, a renegade employee of SynBioTec decides that it is the best course of action to lock himself and 25 others inside a structure known as The Ark, a project that the parent company unwisely put him in charge of. Hidden in Mt. Kosciuszko, The Ark is a seed bank which rivals the Millenium seed bank at Kew Gardens. 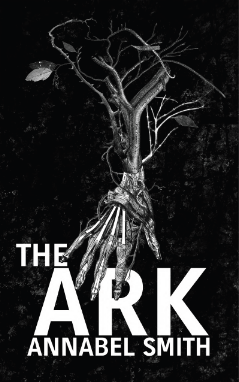 It requires botanists, futurologists, information security officers and many others beside to keep it running, and therefore Aidan Fox invites his employees and select members of their families to report to the Ark for its closure. The Ark is a collection of their correspondence. It tells the story of the end of the world, as we know it, through the points of view of several people who will survive it, at a terrible cost. On one level, it is an opportunity to explore the possibilities of a world after fossil fuels expire, but on a much deeper level, it is (as Amanda Curtin said) 'A character-driven study of human behaviour under the extreme pressures of isolation, manipulation, and fear.' It is an epistolary novel of a completely new kind, told through invented forms of digital communication; the dailemail, the blipp, the gopher, the headless horseman; each type of communication in itself telling the reader something about the state of mind of the character. For example, in the second section of the book, the story is told through the eyes of Ava, the wife of one of the engineers. Ava feels like an outsider from the start, and while she doesn't want to go back outside into the Chaos, she still has very strong connections to the outside world in the form of her sister Tillie, who was not invited to The Ark. As Ava's trust in Aidan begins to waver, she goes from using Dailemail (like email, and able to be monitored by both SynBioTec AND Aidan) to using Gophers, to using Headless Horsemen, (Encrypted, anonymous digital communications developed to be used on secure severs originally by gangs and the Yakuza.) These choices indicate to the reader that Ava is becoming increasingly paranoid. Likewise, in section one, told from the point of view of SynBioTec CEO Kirk Longrigg, Aidan and Kirk communicate through Dailemails and Gophers respectively. Aidan uses Dailes (as they are called) to indicate that he has nothing to hide, but when the men use Gophers, their communication is less polite and business like and they often resort to mud slinging. In section 3 of the novel, the communication is less formal again, told through blog posts or Blasts written by Roscoe, the son of one of the Futurologists. These choices constitute part of the setting of the novel, also, as because this novel is primarily told through dialogue, most of the information about the 'setting' of each scene must come from the context of it's transmission. Despite the hurdles obviously presented by a dialogue based novel, Annabel Smith does a remarkable job of creating a world, and also creating drama and tension. She is able to shift perspective with ease, never once jolting you out of the flow of events. Each of her characters represents a piece of the puzzle, and in particular Ava and Roscoe are instrumental in describing the environment in their letters to the outside world-- although Roscoe's dialogue is written in a parody of modern text speak which even I had difficulty deciphering at times. (For instance, I could not work out for sure what Petched or Tching were supposed to mean.) As readers, we are presented with a stark and clerical space, lit by artificial light, where all concepts of time become largely irrelevant and basic privacies are stripped away for the sake of expedience. I have been told that a lot of the scene setting can also be enhanced by interaction with the book online, through the website and through the digital book. The digital book allows the reader to be an Ark Inhabitant, and participate in the discussion. In Book 1 of the novel, which takes place in 2041, right after the closure of the Ark, 4 different characters replay the same set of 12 months, each in their own words. It is extremely interesting to see different points of view on events, for example Ava's breakdown, which is her whole plot, but a single sentence in the mind of Roscoe, who spends his time trying to show solidarity with his internet friends who are living rough through the Chaos. The cross section of characters shown to tell their stories in this section is interesting, because arguably none of them could be seen to be the major players in the book, and none of them (barring Roscoe) really play significant parts in the action of Book 2, told through more group based communication. However, their motivations are much clearer than the other characters because we have got to know them so well in Book 1. Book 2 is two years later, in 2043, when people have become used to their living arrangements and relationships have started to change. The major plot point of this section is the discovery of a relationship between Aidan and Paige. Paige's husband, Felipe, confronts Aidan, beginning a chain of events which calls into question the structure of society within The Ark. My only niggle with this novel is that I feel as if it ends too soon. I have so many questions. The book begins with a newspaper article from 2093, saying that the Ark is uncovered accidentally and people are found living inside. There are people in there who have been born in there, third generations etc. I would have loved to have seen what the state of affairs was after the Ark was changed by the events of Book 2, and I am dying to know which characters got together in the aftermath. Isadora and Louis? Leilani and Kristjan? (Or Leilani and Roscoe? Roscoe mentions a biologist he has the hots for but the name is obscured.) The Chaos itself could constitute another book entirely. If you loved Wool by Hugh Howey, definitely give this one a go. I agree that it did end suddenly - particularly given that opening article from 2093. However, I also thought it was clever to end it where she did. I'm wondering if she plans a sequel? Hi Whispering Gums, nice to hear from you. Annabel has said on her Facebook and Twitter that she doesn't plan to write a sequel, so I doubt that we'll be seeing any more of the Ark inhabitants, at least for a while. The ending, as it stands, is probably most satisfying because it still leaves us with possibilities, and therefore hope, and I agree that it was very clever. But call me a romantic, I want to see who hooks up with whom.